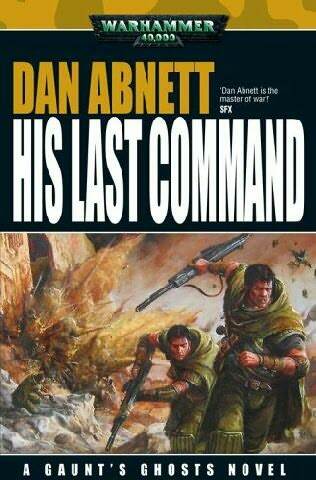 His Last Command continues the 'Lost' arc of the Gaunt's Ghosts series and shows that Abnett is now paying greater attention to continuity than ever before. During the events of Traitor General Gaunt and his team were infiltrated onto a Chaos-held world and had to carry out a very difficult mission. Whilst that was accomplished, the hoped-for extraction never took place and Gaunt and his crew were abandoned on the planet for sixteen months before they could escape under their own power. The result is a rift sewn deep into the ranks of the Ghosts, with the Gereon survivors suffering from various post-traumatic battle stresses, not to mention a form of elitism that comes from their experience that their fellows haven't also shared in. This is an obvious, but still very effective, way of shaking up the Ghosts and severely denting the familial and sentimental feelings that have been building up over the previous eight books. Returning Gaunt to commissar duties and giving the regiment to another commander is also a solid way of introducing fresh conflict to the series, although Abnett carefully avoids cliche by ensuring the new commander is actually an effective and reasonable officer. The result is a book seething with tension, as the Ghosts are divided by their differing experiences, as Gaunt is at odds with the Inquisition and superior officers over their lack of support during their previous mission, and as the various units differ on how to tackle the unique geography of the planet's steppe-cities. These cities are immense mesas divided into 'compartments' by vast walls, with each compartment featuring radically different terrain and weather to its neighbours. Because the steppe-cities were apparently raised as religious monuments to the God-Emperor of Mankind ten thousand years previously, the Crusade can't simply level them from orbit, meaning they have to be taken the old-fashioned way. The steppe-cities are an interesting creation, as good a Big Dumb Object concept as anything in a Greg Bear novel, even if the revelation of their eventual purpose is a little ordinary (although the Imperial reaction to it is hilariously over-the-top). The battle scenes are still robustly-handled, but this novel continues the path from the previous one of focusing more on the internal tribulations of the Ghosts as a team and as individuals, and this added depth continues to be very welcome. 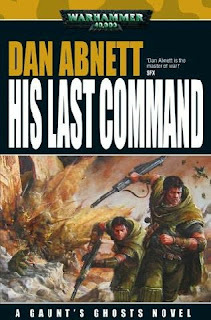 With His Last Command (****) Abnett continues to test and play with the limitations of what can be done with tie-in fiction in a manner that is both entertaining and refreshing. The novel lacks the compelling focus and weirdness of Traitor General, but is otherwise a fine addition to the series. It is available as part of The Lost omnibus in the UK and USA. While reading the part about the division and elitism among the Ghosts because some of them didn't go through the hardships that the others suffered, I was reminded of Band of Brothers. There was an episode where the POV soldier felt a bit left out by the other members of Easy Company simply because he hadn't been with them during the Battle of the Bulge and Bastogne (despite having gone through D-Day and Operation Market Garden). I wonder if Dan Abnett was inspired by that.